Both Scott's and Shackleton's huts have been preserved intact as historical sites by New Zealand’s Antarctic Heritage Trust. The explorers’ tools and supplies, in their original arrangement, are on full display in detailed panoramic images of the huts’ interiors—a departure from the typical exterior perspectives of Street View. Also viewable in the Antarctic series of views is the Cape Royds Adelie Penguin Rookery, the world's southernmost penguin colony and home to many thousands of Adelie penguins. Like all Street View images, including the Scott and Shackleton huts, the Rookery views are static—images of bygone moments frozen in time—but they are no less breathtaking for it. 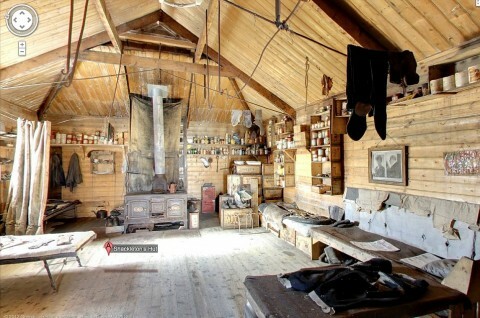 The image below shows the interior of Shackleton’s hut and all of its belongings.